← I’ve found my dream house…oh yeah! Does anyone out there know what this plant is? The flowers look like azalea, but I’m not familiar with the leaves. All the flowers are coming from the bottom part of the plant, too. Paul planted two of these in the little garden at the front lawn area last year and he has no idea what they are. He just picked up some plants at Home Depot and came home and stuck them in there. Didn’t save the tags either. Whatever they are, I like them. But I would love to know their name! 7 Responses to What is this plant? I love, love, love that picture of you and Jasmine! Thanks for putting it here, Bex. Yes, TT, please do post pics of your pupper! Take a picture of it to the Depot… someone there will know what it is! 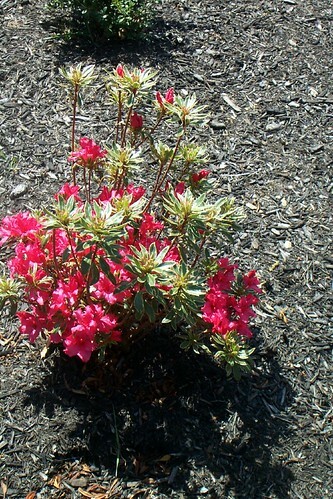 Looks like a variegated azalea to me. Pretty! Hehe, so you caught the bottom picture, Rhu? I snuck that in. I just found that snapshot the other day. That was my beautiful white collie, Jasmine, and she loved to sit on my lap, and every part of me! I think the pink plant is an azalea too but just never saw those leaves before. There are 2 of them in that garden area. Definitely an azalea. Love them! Let’s see–the “plant” in the bottom picture looks remarkably like a collie “planted” on your lap. As for the botanical question, I have no idea.